Aldi Stores and John Lewis tie as Effie UK’s Marketers of the Year. adam&eveDDB earns recognition as Effie UK’s Most Effective Agency. Lidl UK and TBWA\London’s “How Lidl Grew A Lot” is named as the Effie UK’s first Grand Effie winner. LONDON (19 September 2018 / Updated 20 September 2018) -- Winners of the 2018 Effie Awards UK program were revealed tonight at the annual Effie Awards Gala in London. Since 1968, the Effie Awards have honoured marketing ideas that work, and now celebrate marketing effectiveness with 51 programs globally. Tonight’s celebration marks the third year of the competition in the United Kingdom. adam&eveDDB was named the Effie Awards UK Agency of the Year for its work with John Lewis, Marmite, and The Automobile Association, among other brands. John Lewis, with adam&eveDDB, was awarded two Golds: one for “Buster the Boxer: John Lewis’ most effective Christmas ever” in the Retail category and another for its “The gift that keeps on giving: John Lewis at Christmas” campaign in the Sustained Success category (for efforts that have experienced sustained effectiveness for 3+ years). These special recognitions are based on Effie’s standard point system, which recognises all companies credited on a finalist or winning campaign. The Grand Effie winner (the most effective marketing communications effort of the year) was awarded to Lidl UK and TBWA\London, with contributing agencies Starcom and Ebiquity, for “How Lidl Grew A Lot.” The winner was selected following much discussion and debate by a special jury, led by 2018 Jury Chair, Aline Santos, EVP, Global Marketing and Head of Diversity & Inclusion, at Unilever. "Marketers are moving from assumptions to evidence, and they are doing so through data," noted Santos. The 2018 UK winners and finalists were celebrated at Plaisterers' Hall in London, with 14 cases moving on to become winners. 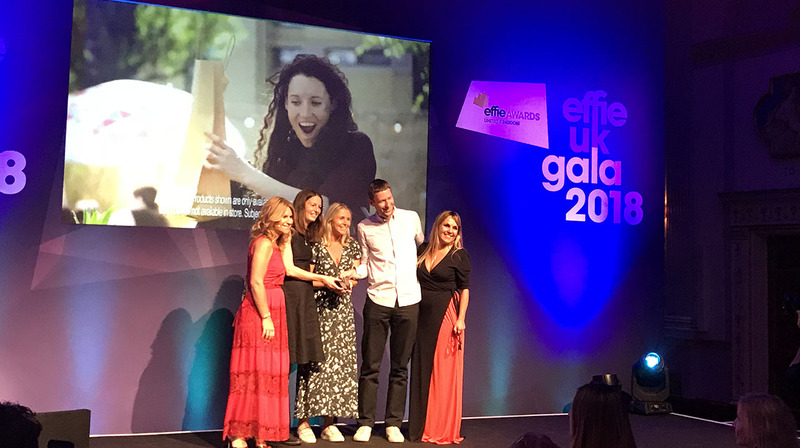 Effies were also awarded to IKEA & Mother (Gold), Beano & Red Brick Road (Silver), McDonald’s & Leo Burnett London (Silver), Yorkshire Tea & Lucky Generals (Bronze), Sainsbury’s & AMV BBDO (Bronze), and Glasgow School of Art & J. Walter Thompson (Bronze). All of the 2018 UK winners and finalists will receive points towards their ranking in the 2019 Effie Index. Visit effieuk.org and effieindex.com for more information. View the full list of 2018 Effie Awards UK winners here. Effie Worldwide is a 501 (c)(3) nonprofit organization that champions the practice and practitioners of marketing effectiveness. Effie Worldwide spotlights marketing ideas that work and encourages thoughtful dialogue around the drivers of marketing effectiveness. The Effie network works with some of the top research and media organizations worldwide to bring its audience relevant insights into effective marketing strategy. Since 1968, the Effie Awards have become known by advertisers and agencies globally as the pre‐eminent award in the industry, and recognize any and all forms of marketing communication that contribute to a brand's success. Today, Effie celebrates effectiveness worldwide with over 50 global, regional and national programs across Asia-Pacific, Europe, Latin America, Middle East/North Africa and North America. Effie initiatives include the Effie Index, ranking the most effective companies and brands globally and the Effie Case Database. For more details, visit effie.org. Follow @effieawards on Twitter for updates on Effie information, programs and news.